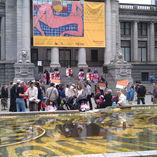 On May 29, 2012, anti-choicers led by the Calgary-based Canadian Centre for Bioethical Reform launched their “New Abortion Caravan” in Vancouver. Their goal is to drive their graphic anti-abortion trucks across the country, descending on Ottawa for Canada Day. After word of this was picked up by the pro-choice community, a counter-protest was hastily thrown together, but managed to attract a similar sized crowd to the pro-lifers. We ended up out-lasting the pro-lifers, both in terms of energy and time on the Art Gallery steps. Cars were generally supportive of us, with a number honking in support of women’s rights. Take a look through the photos below for more. You forgot to mention that we actually enormously outnumbered them by at least 3 to 1 by the time their public sermons were over, and that there was a red-haired pig cop badgering women over what they legally are entitled to do with their bodies in public.